Stanback explores Wordsworth’s conception of disability in the context of this signature work, focusing on ‘Simon Lee’, ‘The Thorn’, and ‘The Idiot Boy’. 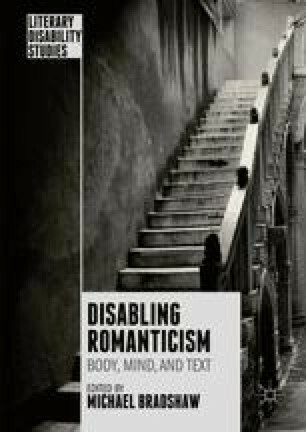 Stanback traces through the poems a theoretical stance akin to contemporary approaches to disability as a source of potential enrichment for individual and community. The poems also intuitively advance what Tobin Siebers terms ‘disability aesthetics’, a system in which ‘disability does not express defect, degeneration, or deviancy’, but rather ‘acquires aesthetic value because it represents […] a critical resource for thinking about what a human being is.’ Although Simon Lee, Martha Ray, and Johnny Foy’s impairments vary in type and etiology, Wordsworth’s poems expose and critique the social and cultural practices that underpin their shared marginalisation. The poems assert the dignity and rich communicative capacity of the impaired, underscoring their human, aesthetic, and communal value.